At this Full Moon, there is an urge to expand, to go for your vision but the Moon is in turmoil conjunct Mars retrograde and opposing the Sun and Vesta in Gemini and Venus in Taurus. It’s possible that this lunation will bring to a head issues that have been rippling under the surface since Mars stationed retrograde in mid April. Fires that have been smoldering could begin to burn out of control, emotions erupt, anger burst out. Sagittarius is normally happy go-lucky but there’s inflammation here that makes me think of the smell of burning rubber. There could be an urge to take off, leave, separate, just run the hell away. 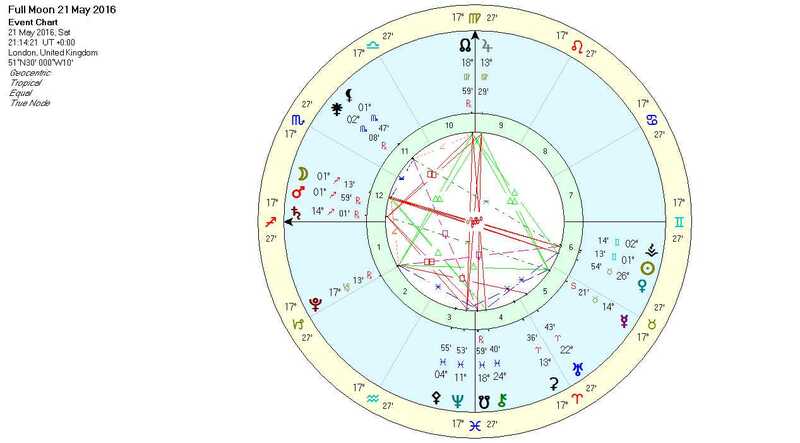 The problem is that with this energy, there’s a frying pan, fire scenario which is why perhaps we have a second Full Moon in Sagittarius next month which will give us another stab at it. With Vesta conjunct the Sun, there is a pull to stick to your word, to focus on gathering information, to talk and talk…and maybe still not come up with any answers (especially as Mercury is currently retrograde). In fact, the complaint for some could be that there’s all talk and no action which could incite sudden attack but it’s rather like wildly flinging arrows and hoping they will hit the mark. With Venus opposite Mars, relationships could be highlighted as the main source of contention. There may be a temptation to go on a crusade, to push, to want it all during this lunation but retrograde Mars is saying you have to go back before you can go forwards. You have to really understand your motivation, your reasons and regain your focus. A perfect way of using this energy would be to quietly examine what you truly want. Ask yourself why you want it and what it really means to you. Sometimes, we have goals but we lose sight of the initial reason why we set the goal in the first place. And sometimes just when we’re in sight of the goal, we realise we didn’t want it after all. It may be necessary to explore those ideas that you have been holding sacred, to see if they really stand up to the test of time, to see if they are in alignment with your ultimate vision. Maybe you need to stop holding a candle to someone or something in order to regain your fire and sense of direction. This symbol brings up images of a storm whipping up a frenzy. The trouble with Sagittarius is that it’s inclined to exaggerate, to ‘big it up’ as Jupiter would say. It makes me think of political speeches pitched with the sole intention of getting a reaction. With Jupiter opposite Neptune, we’ve got distortion through magnification. Recognising that what is on the surface may not be the truth of things is key, especially as the Moon makes a wide but out of sign trine to Chiron. It’s time to get clear about your highest ideals, your deepest beliefs. Fall back on the Grand Earth trine with Mercury, Jupiter and Pluto striving to work in your favour. Think long and hard, explore your options. Exercise restraint. Ruler Jupiter in Virgo shows that we have to be as humble and patient as the Master’s apprentice. What is truly sacred will survive the fires of Mars and reveal the next horizon.